Jeggings are a new kind of trousers. 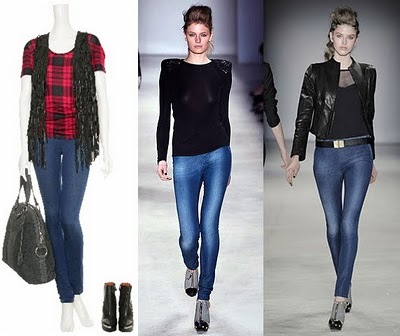 They incepted as a coupling of leggings and jeans. Simply they are thicker and more immune leggings- but still only leggings- with jeans appearance. They are ussualy made of cotton, polyester or spandex. Shops are slowly filled by them. At the moment a man can buy them at webpage : www.asos.com, www.topshop.com . But here is one question : Are jeggings only one of further fashionable sparging with short lifetime, about which magazines will write captions like “LEGGINGS- MUST HAVE” or really new kind of clothes?